If you are looking to move out of NYC, then purchasing real estate in Rockland County, NY has probably been on your radar. The inventory of homes presents any buyer with some very interesting choices. Some homes in Rockland boast great views from high on the shore, while other properties are truly waterfront homes. It is all about the river when it comes to these luxury homes. Finding the perfect home along the Hudson River may be a bit of a challenge, as they get scooped up so quickly. Not so very long ago if you mentioned Rockland County to someone from New York City, their likely response would have been, “Isn’t that upstate somewhere?” Rockland County, which is only a scant thirteen miles north of the George Washington Bridge, managed to stay rural and secluded longer than its eastern neighbor of Westchester County. In fact, as late as the 1960’s a number of phone lines in Rockland were still operating as “party-lines” which meant if you picked up your home phone you could listen in on a neighbor’s conversation down the street. Yikes! 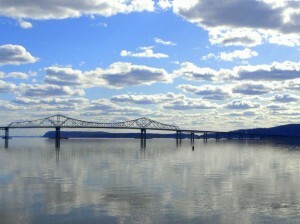 Since the opening of the Tappan Zee Bridge in the late 1950’s, however, New York’s smallest county has emerged as a major New York City suburb, complete with affluent neighborhoods, excellent school systems, fine restaurants, world-class marinas (oh yes, we have homes with waterfront views), bustling shopping centers, tremendous parks and an outstanding public transportation system. A late bloomer but always a stunning beauty. The natural boundary of the Hudson River stunted Rockland's growth for many years. Travel to the county before bridges and tunnels across the Hudson River required crossing by ferry. Because of its relative remoteness and distance from NYC, Rockland remained a land of family farms and small quiet towns until the beginning of the twentieth century. Rockland’s quiet countryside was far from quiet, however, during the Revolutionary War. Washington and his troops slept in fields along Strawtown Road in West Nyack before marching up King’s Highway to the battle of Stony Point. Benedict Arnold’s spy crony, Major Andre, was imprisoned in Mabie’s Inn (now the site of the 1776 House Restaurant in Tappan, New York). Andre was tried and hung just down the road from Mabie’s on October 2, 1780. If you want proof, check out the granite monument in the middle of Andre Hill Road in Tappan, it marks the very spot. Yesterday’s Rockland is history, today’s RC really rocks. Rockland County started to become a truly cool place to hang (excuse the pun, Major Andre) in the twentieth century – well before the Tappan Zee Bridge was even conceived. Its natural beauty and quiet country atmosphere made it a perfect getaway for many influential New Yorkers. Famous 1930’s playwrights like Maxwell Andersen and Kurt Weil discovered the secluded charms of New City’s South Mountain Road – as did bad boy rock 'n' roller Mick Jagger in the early 1980’s. Early film mogul Adolf Zukor spent years living and working on this same New City road. Actress Helen Hayes settled into her beautiful mansion, Pretty Penny, along the Hudson in Upper Nyack in 1930’s. Pretty Penny was eventually sold to comedy star Rosie O’Donnell who later sold it and built her own new mansion in Upper Nyack. The list of famous people who have called Rockland home at one time or another is truly amazing: TV music conductor Mitch Miller, actors Burgess Meredith and Jack Klugman, song-writer composer/singer Neilson, academy-award winning director Jonathan Demy, actor Steven Baldwin, actress Darlene Dahl, actor Al Pacino, TV journalist Mike Wallace … the list goes on and on. Even President Teddy Roosevelt spent a night or two in Nyack as a getaway. Rockland continues to attract influencers from down state. The sleepy village of Piermont along the Hudson was a quiet hamlet until Woody Allen shot The Purple Rose of Cairo there. Overnight it went from the town time forgot to the something quite tres chic. You’ll find movers and shakers hidden in the high cliffs of Grand View on Hudson. You’ll find even more of them comfortably ensconced just before the New Jersey border in Snedens Landing or in Upper Nyack. From Farms to Factories to Fabulous. With the advent of the 20th century, Rockland became more than just farms. It was home to the Knickerbocker Ice Company which cut ice from Rockland Lake and sold it in New York and New Jersey in the era before refrigeration. Rock quarries were in abundance, too. After all, it wasn’t called Rockland for nothing! Brick-making was also a big industry and a mainstay of the town of Haverstraw for many years. Eventually, the farms were sold and parceled out to land developers, the ice business gave way to new more modern kitchen conveniences, and the brick makers moved on. What arrived in their place were people from the city. It began slowly in the 1950’s and into the 1960’s but the paced quickened steadily by the 1970’s and just kept building. Because the boom in Rockland housing came late in the twentieth century, the county is filled with many ranch style houses, particularly raised ranch style homes, which were popular in that era. There are exceptions to this rule. Certainly the Victorians in Nyack and in other Rockland River villages display a much more 19th century sensibility. Add to that the Mac Mansion era of the 21st century and you find quite an interesting mix of housing styles in the county. Despite all the development, however, Rockland still remains quite green. One reason is that Rockland is a “Preserve America Community” with one third of its land designated as park land. Another reason is that zoning laws and land prices have held development in check for many years. Acre parcels gave way to half- acre ones which finally gave way to third acre lots. The result is housing in Rockland tends to put more space between its neighbors. Even with its housing boom and zoning room, Rockland house prices still tend to be lower than those in Westchester County, that has quite a few more homes with multi million dollar price tags. Rockland still ranks as the 6th affluent county in New York and enjoys one of the highest household median incomes in the U.S. according to the 2010 U.S. census. Beautiful homes of great variety are found at every turn. Rockland contains five towns and nineteen incorporated villages, and several hamlets. Each of the five towns has its own police force and all have at least a volunteer fire and ambulance service. You’ll find each town has a character and a personality of its own. Okay, it’s pretty but what can you do in Rockland County? Like to shop? Well, you’re going to like it here. Rockland is home to the Palisades Center. It’s more than just a shopping mecca, it’s a dining and entertainment hub as well, complete with fine restaurants and an IMAX theater. Down the road you’ll discover the newly re-purposed Shoppes at Nanuet. This open air shopping plaza also features high-end stores and fine restaurants. If antiques are your thing, Nyack offers some of the finest antique shopping in New York State as well as a quaint, Victorian village you’ll find irresistible. Nyack, too, does not want for fine dining spots. In fact, you’ll find dining treasures across the entire county. Name a cuisine and you’ll probably find a place to enjoy a great meal, close to home. Rockland offers several community theater groups including the Elmwood Playhouse in Nyack and the Antrim Players in Suffern. But if you prefer Broadway, you’re always just a short drive, train ride or bus ride away from the Great White Way. Rockland has a top-notch community college plus several private colleges including: Nyack College, Saint Thomas Aquinas, Dominican College, Iona College and Long Island University. Of course, being within twenty five miles of NYC and since you are just across the border from New Jersey, you have even more options..
Rockland has many assets: parks, restaurants, great neighborhoods and towns, a diverse population and a vibrant community spirit. Yet despite all its growth in both population and status, Rockland can still seem bucolic with its vast areas of green space. If you yearn for the bright lights of the Great White Way, one of the world’s great ones is just down the road a piece. You can live in Rockland and easily work in New York City. You can live in Rockland and easily work in New Jersey or Westchester. You can even easily live and work right in Rockland County. It’s got something for everyone. Begin your search for a home in Rockland County. I'd be happy to set up a custom search just for you. See something you like? Make sure to call today. Read more about Rockland County on their Community Page. Find out about the local resources available. Please let me know if you need any additional information on the area and I'll be glad to help.